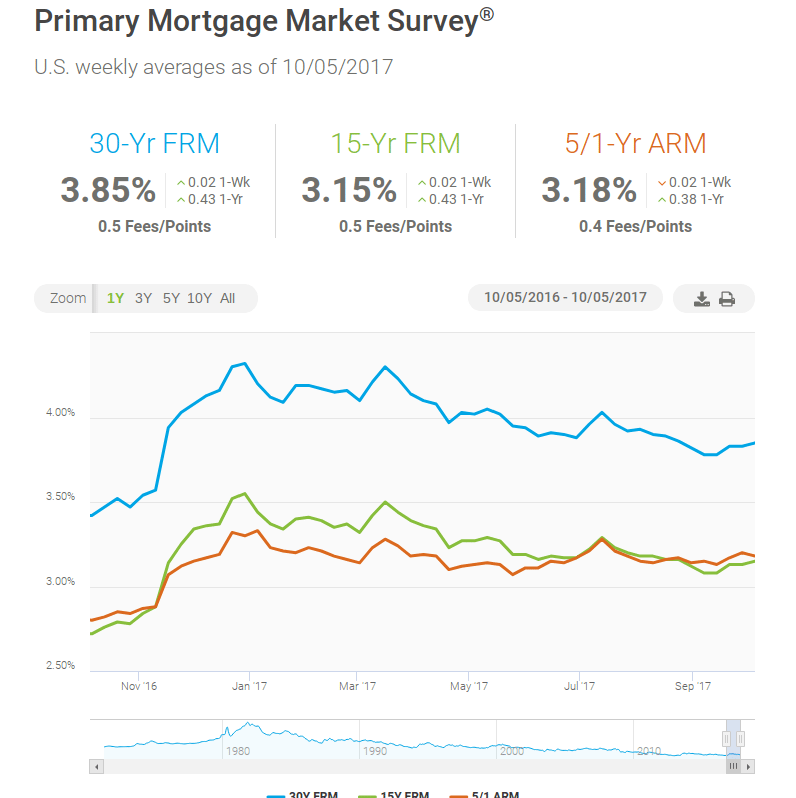 30-year fixed-rate mortgage (FRM) averaged 3.85 percent with an average 0.5 point for the week ending October 5, 2017, up from last week when it averaged 3.83 percent. A year ago at this time, the 30-year FRM averaged 3.42 percent. 15-year FRM this week averaged 3.15 percent with an average 0.5 point, up from last week when it averaged 3.13 percent. A year ago at this time, the 15-year FRM averaged 2.72 percent. 5-year Treasury-indexed hybrid adjustable-rate mortgage (ARM) averaged 3.18 percent this week with an average 0.4 point, down from last week when it averaged 3.20 percent. A year ago at this time, the 5-year ARM averaged 2.80 percent. 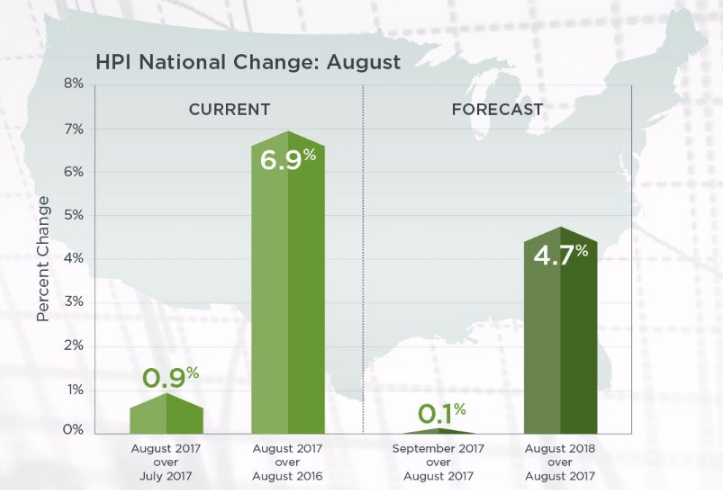 Home prices nationwide, including distressed sales, increased year over year by 6.9 percent in August 2017 compared with August 2016, and increased month over month by 0.9 percent in August 2017 compared with July 2017. 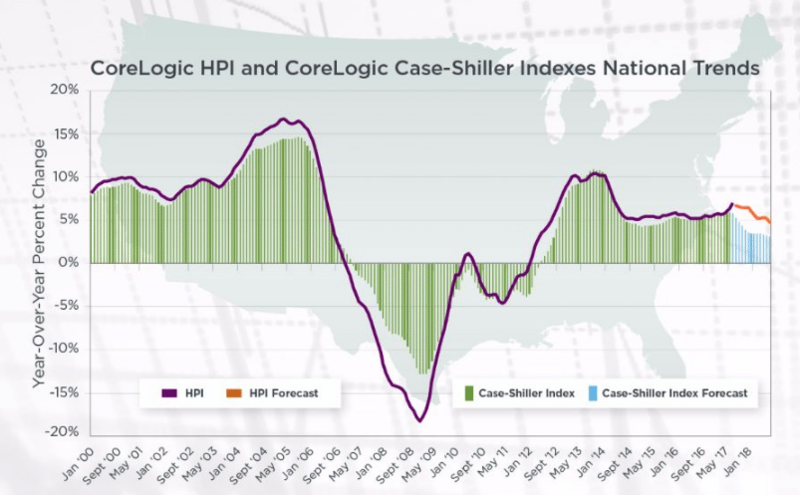 The CoreLogic HPI Forecast indicates that home prices will increase by 4.7 percent on a year-over-year basis from August 2017 to August 2018, and on a month-over-month basis home prices are expected to increase by 0.1 percent from August 2017 to September 2017. Utah and Washington continue to post double-digit annual price gains. Las Vegas home prices increased 8.4 percent year over year, the highest among large metros.